BIG SCHOOL GETS A PEEK-IN Nebraska Has Applied for Western Conference Membership. NO VOTE TAKEN ON QUESTION Leak, Stiehm Says, Only Thing that Kept Cornhuskers from Getting Into Big Company This Spring at Madison. By JAMES E. LAWRENCE. LINCOLN, June 14. - (Special) - Walter Eckersall, famous gridiron hero of the University of Chicago, will officiate the Iowa-Nebraska foot ball game to be played in this city next fall, according to announcement made here today by Coach Jumbo Stiehm. While in the east attending a meeting of those promoting the American Olympic games Stiehm saw Eckersall and the latter consented to act as an official the lowa-Nebraska contest. Stiehm will early dispose of the official problem, profiting by past experience that it does not pay to allow the matter to drag along until a short time before each game. 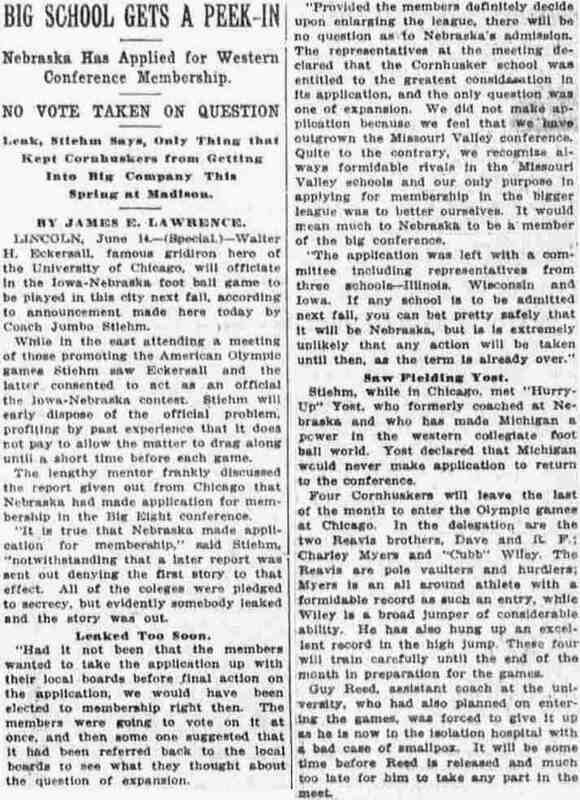 The lengthy mentor frankly discussed the report given out from Chicago that Nebraska had made application for membership in the Big Eight conference. "It is true that Nebraska made application for membership," said Stiehm, "notwithstanding that a later report was sent out denying the first story to that effect. All of the colleges were pledged secrecy, but evidently somebody leaked and the story was out. Leaked Too Soon. "Had it not been that the members wanted to take the application up with their local boards before final action on the application, we would have been elected to membership right then. The members were going to vote on it at once, and then some one suggested that it had been referred back to the local boards to see what they thought about the question of expansion. "Provided the members definitely decide upon enlarging the league, there will no question as to Nebraska's admission. The representatives at the meeting declared that the Cornhusker school was entitled to the greatest consideration in its application, and the only question was one of expansion. We did not make application because we feel that we have outgrown the Missouri Valley conference. Quite to the contrary, we recognize always formidable rivals in the Missouri Valley schools and our only purpose in applying for membership in the bigger league was to better ourselves. It would mean much to Nebraska to be a member of the big conference. "The application was left with a committee including representatives from three schools - Illinois, Wisconsin and Iowa. If any school is to be admitted next fall, you can bet pretty safely that it will be Nebraska, but it is extremely unlikely that any action will be taken until then, as the term is already over." Saw Fielding Yost Stiehm, while in Chicago, met "Hurry-Up" Yost, who formerly coached at Nebraska and who has mode Michigan a power in the western collegiate foot ball world. Yost declared that Michigan would never make application to return to the conference. Four Cornhuskers will leave the last of the month to enter the Olympic games at Chicago. In the delegation are the two Reavis brothers, Dave and R. F., Charley Myers and "Cubb" Wiley. The Reavis are pole vaulters and hurdlers; Myers is an all around athlete with a formidable record as such an entry, while Wiley is a brood jumper of considerable ability. He has also hung up an excellent record in the high jump. These four will train carefully until the end of the month in preparation for the games. Guy Reed, assistant coach at the university, who had also planned on entering the games, was forced to give it up as he is now in the isolation hospital with a bad case of smallpox. It will be some time before Reed is released and much too late for him to take any part in the meet.